Poverty is real, and it’s not caused by laziness and moral weakness. Now I hear one of my sisters and at least three of my nieces screaming at me, “Yes, it is! I know this guy who just drinks and won’t work! My friend at work has a next door neighbor who just keeps having one kid after another and doesn’t even try to get a job.” Okay — there are some people who screw up, and some of them are poor because they screw up, but the fact is that poverty is mostly not caused by laziness and moral weakness. Who’s poor in the United States? Working your way out of poverty is a great idea. If you have kids and daycare costs as much as you can earn, then working your way out of poverty doesn’t work. Think there’s affordable daycare or public subsidies for daycare? Think again — virtually every safety net program, inadequate to begin with, has been cut in recent years. Housing subsidies? Get in line — and wait for years. Childcare assistance? Only for the lucky. Children: About 35 percent of the people living in poverty in the United States are children: 16.4 million children out of the 46.2 million people living in poverty. People of color: Black and Hispanic poverty rates dropped to the lowest rates ever in 2000, though still remaining higher than the rest of the population. Then came the recession, and poverty rates for both groups rose again, to about 27 percent, compared to about 15 percent for the overall U.S. population. Historic discrimination, low-wage jobs and last hired/first fired practices contribute to a huge disparity in employment and poverty for black and Hispanic workers. Those numbers include before-tax wages, unemployment, social security, public assistance, child support, alimony, veterans’ benefits, pensions … just about every form of cash income. They don’t include housing subsidies (which are very limited and have years-long waiting lists), or food stamps (about $31.50 per person per week), or other non-cash benefits, such as free or reduced-price school lunches. Think about what groceries cost for your family. Think about housing costs. In the Twin Cities, the average rental cost for an apartment (not a house) is $951. That’s $11,412 per year — more than half the total, before-tax poverty level income for a family of four. Families with income up to double the official poverty rate are considered low-income. In 2009, at the height of the recession, one working family out of every three was low-income. 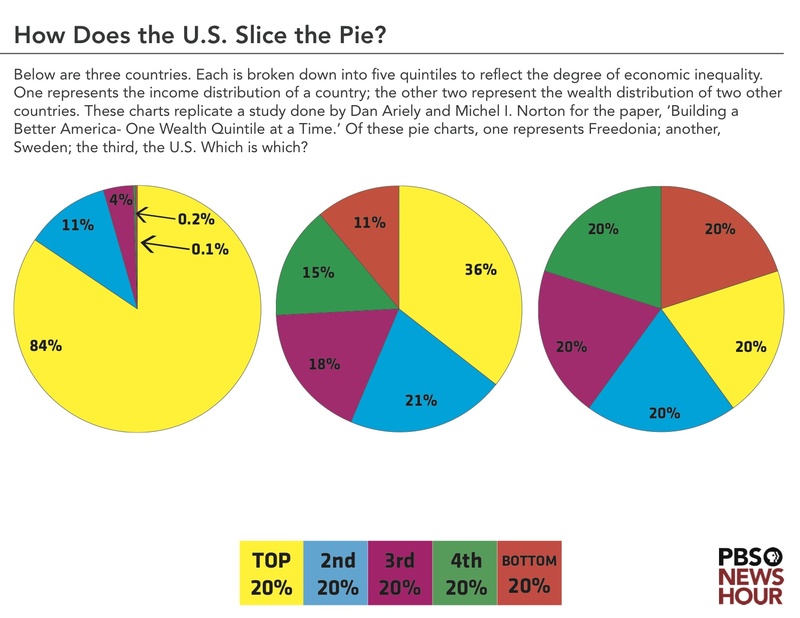 In the academic study that preceded the PBS series, 92 percent of the people surveyed wanted to live in “Country B,” where wealth is sort of, but not quite, evenly distributed, rather than “Country C,” where the richest 20 percent of the people own a whopping 84 percent of the wealth. Where, in fact, the richest one percent of the people own more than a third of the country’s wealth.Country C — that would be us. 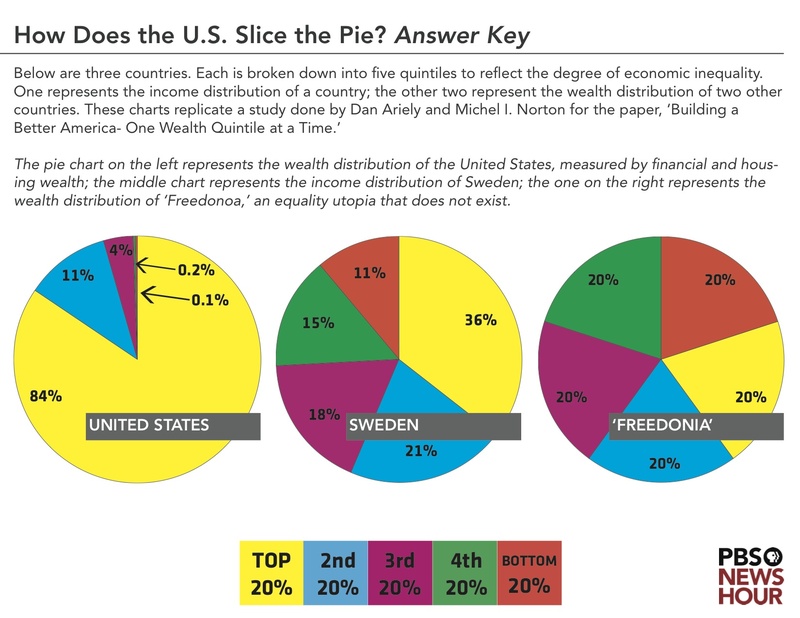 Yes, the United States is “Country C.” Sweden is “Country B.” (The equal distribution of “Country A” doesn’t exist anywhere in real life — that’s the mythical land of Freedonia.) The PBS series explores, first, rising inequality in the Land of the Free, Home of the Poor, and second, differing opinions on whether that inequality contributed significantly to the recession in Americans Facing More Inequality, More Debt and Now More Trouble? Class warfare: How much money is middle-class?